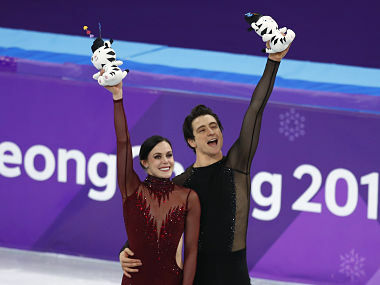 Gangneung, South Korea: Canada’s Tessa Virtue and Scott Moir smashed the short dance world record as French rival Gabriella Papadakis suffered her "worst nightmare" with a wardrobe malfunction at the Olympics on Monday. As Virtue and Moir glided, twizzled and spun their way to a best-ever score of 83.67, Papadakis and Guillaume Cizeron performed stoically in the face of the embarrassment of her dress becoming unclipped early in their routine, exposing a breast. 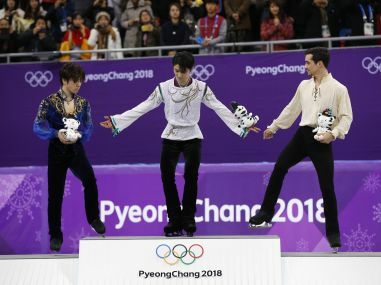 "It was pretty distracting, my worst nightmare at the Olympics," the 22-year-old Papadakis said. "I felt it right away and I prayed. "I told myself 'you have to keep going' and that's what we did, and we have to be proud of ourselves, delivering a great performance with that happening." A great performance it was with the Olympic debutants' samba-rhumba-samba to two Ed Sheeran hits earning them 81.93 to go into Tuesday's free dance final just behind the Canadians. Lying in the bronze medal position in this discipline likened to ballroom dancing on ice were Americans Madison Hubbell and Zachary Donohue. Remarkably, all three couples are coached at the same centre of skating excellence in Montreal run by Marie-France Dubreuil and her husband Patrice Lauzon. After bettering the record they themselves had set of 82.68, Virtue commented: "Better than setting the record was the feeling we had when the music ended, we were able to look at each other and take a moment and feel that pride, knowing that we had to have a strong skate today." Despite their show-stopping samba-rhumba-cha performance to the Rolling Stones and the Eagles' Hotel California, a second ice dance title is by no means in the bag for Scott and Moir as Papadakis and Cizeron could well overtake them if they produce their best free dance. "Our work is not over," conceded Moir, who despite his vast experience — this is his third Olympics — admitted to an attack of the jitters as the music for their routine began. "I was pretty nervous today, but I was able to look into Tessa's eyes and squeeze her hand, she was a rock today, I needed that." The pair were ice dance champions in Vancouver in 2010 but in Sochi four years ago Virtue and Moir, who joined forces way back in 1997, were edged out of defending their title by their then training partners Meryl Davis and Charlie White. They then took two years out, switched coaches, and returned better than ever, claiming their second world title at the expense of Papadakis and Cizeron in Helsinki last year. 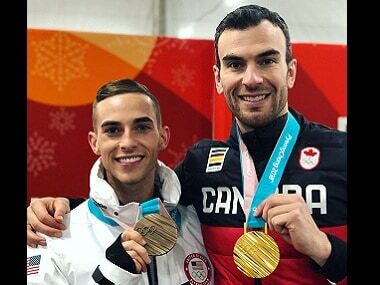 Having taken silver in the team event in Sochi too they helped Canada turn that into gold in Pyeongchang last week, and are now — barring disaster — certain to claim a record fifth figure skating medal. For Moir, the Olympic experience is truly awe-inspiring. "At this point in our career we have a better grasp of what it's like to skate with the (Olympic) rings on the ice. "This is what the spirit of the Games is all about. "We have a lot of work to do tomorrow, the butterflies will be flying again, that's the beauty of the Olympics, with all the country watching back home, we are trying to make them proud." While the Canadians are out in front their French rivals will fancy their chances of overhauling them in the free dance. The first ice dancers to break the 200 points barrier last year produced a best ever combined score of 203.16 at the European Championships in Moscow last month, suggesting an epic free dance battle is in store on Tuesday.